We have the transportable football bleachers that you've been looking for. And because its from BuiltRiteBleachers.com you know its always top quality at low prices everyday! 5 Row - 24'L -Preferred Transportable Bleacher (2 footplanks)- Seats 80 - Weight 1559 lbs. 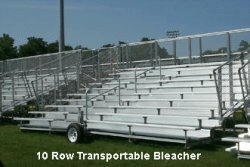 5 row x 24' non-elevated transportable bleacher- Net seating capacity 80-Aluminum angle understructure-(with wheel brackets and additional bracing)-2 X 10 anodized aluminum seat plank-Double mill finish aluminum foot plank-1 x 6 riser row 4, (2) 1 x 6 top row risers-2 X 6 Treated lumber groundsills-Chainlink guardrail system.